Managing Adelaide’s water supply requires best practice technology, as SA Water aims to recycle a growing body of sewage, parts of which may have otherwise gone to landfill. Garry Smith, Allwater Land Manager, works closely with SA Water as part of the organisation’s metropolitan alliance partnership. Garry manages Allwater’s biosolids program, which processes and recycles sewage at SA Water’s three major metropolitan wastewater treatment plants: Bolivar, Glenelg, and Christies Beach. Collectively, the three facilities process more than 250 megalitres of sewage each day, with Bolivar treating the most at about 150 megalitres. Biosolids are treated sewage sludge that can be used as a soil conditioner for both broadacre and horticulture applications. To help develop its biosolids product, Allwater has been using the Backhus Windrow Turner for the past 15 years. Allwater produces 40,000 tonnes of treated biosolids per annum, and of that, 15,000 tonnes goes through the Backhus Windrow Turner each year. Garry says the biosolids are processed under Environmental Protection Authority-approved guidelines, with the majority of its biosolids material provided to broadacre farmers in the state free of charge. He says the material is used by farmers to improve their yield of wheat, barley, canola, vines and fruit trees. 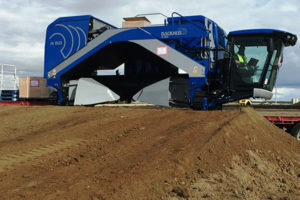 To bring its machines in line with contemporary operations, SA Water in 2017 purchased two new windrow turners from the Backhus A-series, the A 50. The purchase was secured through a competitive tendering process with equipment specialists GCM Enviro. SA Water’s large sewer pipe system connects to 400 pumping stations and 25 treatment plants across the state. After the wastewater is filtered at a treatment plant for large and small solid materials like plastics and grit, it’s separated into sludge and water. Garry explains the sludge is then converted into gases like methane to help power the treatment plant or begin a process to transform it into biosolids. This material is either stockpiled for further processing or put through centrifuges which transform the sludge from approximately four per cent solids and 96 per cent water to 20 per cent solids and 80 per cent water. “After this, we take the material and spread it out on a hard stand of about 6.5 hectares. It’s then placed in rows and we put the Backhus Windrow Turner through these rows for composting and accelerated drying,” he says. Garry says the sludge must be at least 75 per cent solids before it can be re-used. The windrow turners are used once a week in summer and once a fortnight in winter. The windrow turner operates for eight hours twice a week to process the materials. As the surface of the sludge dries naturally, it’s turned to develop a product of up to 85 to 90 per cent solids in the summer. The windrow turners are used once a week in summer and once a fortnight in winter. The Backhus A-Series helps Allwater develop a robust dry biosolids product from the wet heavy materials, with a turning capacity of 3600 cubic metres per hour. “We needed a robust machine that could turn soil-like material which weighs about 0.8 tonnes per cubic metre and we turn roughly three cubic metres to every metre per row,” Garry says. The machine also offers high performance diesel, which Garry says is key to prudent environmental management. Garry says the comfortable, easily accessible and panoramic cab has been improved for the operator with smart dashboards for real-time data of the turning process, along with improved access to motors and radiators for added safety. He says while Allwater has yet to measure its fuel consumption savings, it is working its machines much harder and is hopeful this will be improved. Designed for the challenges of the future, the Backhus A 50 has been developed to be customisable for any scale of environmental composting. The A 50 offers a windrow width of up to 4.3 metres and a windrow height of up to 2.3 metres, allowing the operator to turn more materials quicker. It’s all part of Allwater’s plan to expand its biogas operations as it has also commenced its next phase of accelerating the drying of sludge in lagoons. Garry says Allwater is now using the new windrow turners to dry material in the lagoons and in the stockpiles. He says the new machines have a wider landfill track, which ensures it remains stable on wet ground. Garry says the Backhus Windrow Turner meets all of Allwater’s specifications and GCM Enviro is on hand to deal with any maintenance issues should they arise.